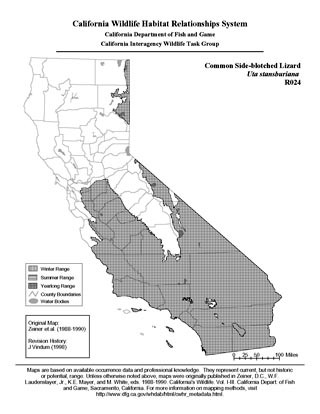 The common side-blotched lizard is common to abundant throughout arid and semi-arid regions of the state, excluding most of northern California, the Sacramento Valley, the Sierra-Cascade ranges, and several of the Channel Islands. Its elevation range extends from below sea level to over 2440 m (8000 ft). Prefers open habitats including desert cactus scrub, coastal scrub, chaparral, grass, juniper, pinyon pine-juniper, Joshua tree and valley-foothill. 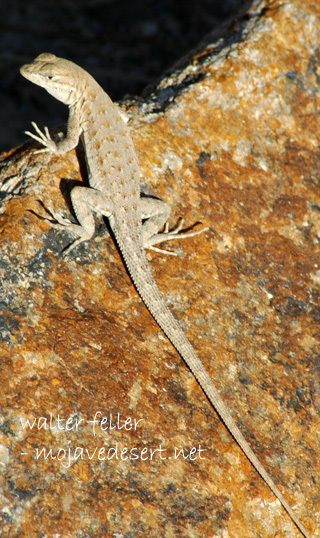 Feeding: Side-blotched lizards eat a wide variety of insects and other arthropods. Little time is spent foraging. Lizards feed opportunistically on any moving insect of suitable size that passes nearby as they bask or move about their home range. Food also includes scorpions, spiders, mites, ticks and sowbugs. Some vegetable material is eaten either accidentally or possibly for water. Cover: Seldom climbs. It, therefore, must hide in rock crevices and under other objects of sufficient size. Reproduction: Little is known about oviposition sites. In the lab, eggs are deposited in moist sand. 3 clutches have been found in soil 0, 11, and 12 cm (0, 27.5, and 30 in) beneath a large stone. Water: Water is probably obtained from food. Vegetable material may be eaten as a source of water. Pattern: Open habitats are preferred. It is uncommon or absent from dense chaparral or other dense plant growth. Activity Patterns: Diurnal, ground dwelling. The peak activity period is late afternoon, although there is some activity all day. Side-blotched lizards usually bask in the morning, retreat to the shade of bushes midday, and move about their home range in the late afternoon. Males more actively patrol their home range than females. Lizards are active all year, although activity during the winter is dependent on temperature. Home Range: Home range size varies with year, with location, and inversely with density. Home ranges of males are larger than home ranges of females. Male and female home range sizes vary from 400 to 800 m2 (0.05 to 0.20 ac) and 65 to 490 m2 (0.02 to 0.12 ac), respectively. The highest density of adults occurs in the spring during the breeding season and declines thereafter. Adult mortality may be over 90%, with virtually complete annual turnover of adults in some populations. Spring adult densities range from 30 to 83 per ha (8 to 33 per ac) depending on year and location. Juvenile densities are greatest in July, ranging from 150 to 297 per ha (60 to 119 per ac) and decline thereafter. Juvenile mortality is 80 to 85%. Territory: Both male and female side-blotched lizards defend home ranges. Aggressiveness declines during the winter months in favored winter retreats where food may also be concentrated. Reproduction: The breeding season lasts from March to August. Mating occurs from April to May; egg deposition occurs from late April to August. Females store sperm for delayed fertilization. Side-blotched lizards are monogamous. Clutch size is positively related to size of female, winter rainfall and spring annual production, and inversely related to season and density. Clutch size varies from 1 to 8 eggs (av = 4). One to 7 clutches per year are produced. Hatchlings appear from June to late September. Development time also decreases with season and is 61 to 77 days. Males and females reproduce the first spring following hatching at approximately 43 mm (1.72 in) snout-vent length. Niche: Predators of side-blotched lizards are numerous, resulting in high mortality. Snake predators include rattlesnakes and sidewinders, coachwhips racers, gopher snakes, kingsnakes, patch-nosed snakes, long-nosed snakes and night snakes. Lizards that eat side-blotched lizards include whiptails, desert spiny and leopard lizards. Burrowing owls, American kestrels, roadrunners, and loggerhead shrikes also eat side-blotched lizards.